Confession: before my partners in crime here at the Graphic Novel Hovel pointed out to me the merits of comic books and their influence on my beloved graphic novels, I had never picked one up myself, had never become acquainted with Spider-man, Batman, X-Men and the like beyond the recent Hollywood film enterprise, unless riding the roller coasters at the Six Flags Super Hero Adventure Park counts as forging some sort of bond. I always kind of thought comic books were merely television shows on paper for young boys, with a penchant for polarizing good and evil. 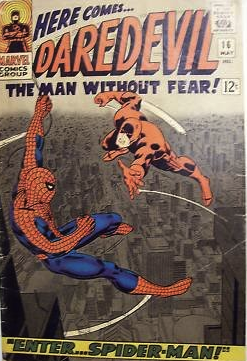 Enter my weekday night reading of one of the earlier issues of Spider-man, Here comes Daredevil, The Man Without Fear (released May 16, 1966), and exit my clearly false preconceived notions about the art of comic books. Wait, hold on a second, this is embarrassing, but I might just have to consult a dictionary to get the meaning of at least one of those words. For those of you who likewise do not include “lachrymose” in your repertoire of vocab, here’s the definition, via the widget dictionary on my macbook: “adjective, formal or poetic/literary – tearful or given to weeping, inducing tears; sad.” And there you have it, folks. This word alone proves my point: Spider-man is poetic, so poetic that even the words used to describe the making of the comic are, well, poetic. Don’t believe me? Well, if the names of some of the featured characters aren’t enough to convince you – Peter Parker, The Masked Marauder, and Matt Murdock – I’ve compiled a totally incomplete list of just some of the instances of alliteration, onomatopoeia, and rhyme. When I think about it, the use of these tools makes complete sense – comics, like poems, practice brevity, speak with few words – so why wouldn’t the writers of these adventure stories look to verse for inspiration? Teachers of America: this is a hint. Why not make poetry more accessible by first introducing the elements of poetry – that is, the literary devices that bring breath to a piece – in the form of something not at all intimidating and completely compelling to young audiences, like comic books? I think it would be well worth a try! I could go on and on, but instead I’ll just suggest you go get cozy with a comic yourself. And I’ll leave you with this one last thought: this issue of Spider-man even uses the language of literature and storytelling – words like “yarn” and “cliffhanger” appear in midst of the story -which makes me compelled to think that comics might be a form of metadiscourse – writing about the art of writing in itself. And to think, all this time I’ve thought they were the guilty pleasures of boys who never grow up. Thank you, you scarlet adventurer, you, for getting my literary spider senses a’tinglin’. This entry was posted in Book Reviews, Introductions and tagged comic books, literary merit, Spiderman. Bookmark the permalink. Love this post! and I’m so glad you’ve changed your mind about the usefullness of comics. Are you ready to tackle Hamlet a la Classics Illustrated?